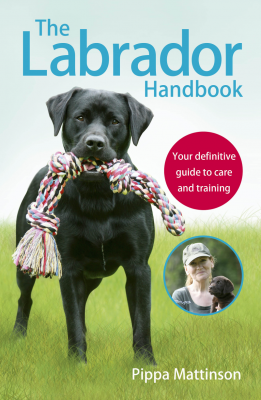 Welcome to our complete guide on the Saint Berdoodle. This adorable looking mix is a cross between a Saint Bernard and Poodle. If you’re thinking about getting one or wondering if it’s the right dog for you, you’ve come to the right place. We will cover everything you need to know about this remarkable dog. First generation mixes are called designer dogs, as they have been intentionally designed as new breeds. There are many arguments about whether this practice is good or bad, and there are a lot of supporters on both sides of the fence. Supporters of designer dogs regularly claim them to be healthier than purebreds. While this is difficult to prove, there is evidence that purebreds have reduced vigor compared with mixed breeds. This means that on average they have a shorter lifespan and a lowered ability to procreate. If you would like to read more about this controversy, here is a great, unbiased article which goes further into the pros and cons of each camp. To explore the full history of the St Berdoodle mix, we will first look at the background of each purebred parent. These lovable dogs got their name from the Great Saint Bernard Pass through the Alps between Italy and Switzerland. An Augustine monk named Bernard de Menthon built a monastery and hospice there in the middle of the eleventh century. Around 1700, the dogs of the monastery began working as search and rescue dogs for lost or injured travelers. The first record of breeding these dogs outside of the hospice was by Heinrich Schumacher in Switzerland in 1855. The Swiss Kennel Club was founded in 1883 and adopted the first Swiss Saint Bernard standard in 1884. Since that time, three different Saint Bernard standards have developed. There is an American standard, which is a modification of the original Swiss version. There is also an English version. Now there is a revised Swiss version which was adopted by all the Fédération Cynologique Internationale (FCI) countries in 1993. Poodles originated in Germany as duck hunters over 400 years ago. Hunters bred them to be water retrieving dogs. They began shaving their legs, neck, and tail to assist with greater mobility while the dogs were swimming. The rest of the fur remained intact to keep the Poodles warm while swimming in chilly water. The French found the resulting look to be very elegant, and Poodles became very popular dogs in France. Poodles have also historically been used in European circuses, thanks to their great show personalities and ability to learn tricks . These dogs even worked as truffle hunters due to their strong noses. The Standard Poodle was the original. It has since been bred down to the Miniature, and even further to the Toy in the early 20th century. All three varieties share the same breed standard, with the exception of size. Little is known about the beginnings of the Saint Berdoodle. It is believed to have originated in the US in the 1880s. “Doodles” have grown in popularity in recent years and the St Berdoodle is no exception. 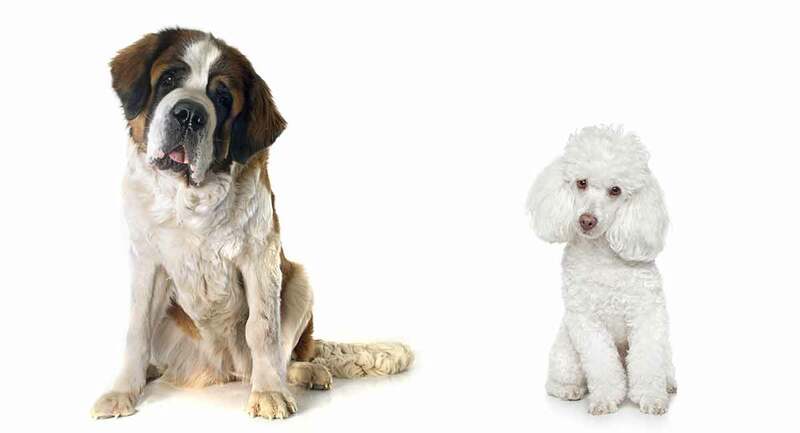 A St Bernard Poodle mix could end up with the appearance of either parent breed, or a mix of the two. A Saint Bernard is one of the largest breeds of dogs. Males typically range between 140 and 180 pounds and 28 to 30 inches tall. Females are slightly smaller, roughly 120 to 140 pounds and 26 to 28 inches tall. These gentle giants have huge heads with short muzzles, dark eyes, and wrinkled brows. They are powerfully strong and well-built animals. Saint Bernards have very dense, short-haired coats that are smooth yet tough, according to the American Breed standard. There is also a long-haired Saint Bernard that is recognized by the FCI breed standard. Saint Bernards are usually white and red or white and brown-yellow. Poodles come in three possible sizes. Standard Poodles are between 60 to 70 pounds for males and 40 to 50 pounds for females. They typically stand over 15 inches tall. Miniature Poodles weigh between 10 and 15 pounds and stand between 10 and 15 inches tall. Toy Poodles weigh only 4 to 6 pounds and are shorter than 10 inches tall. Poodles are well-proportioned dogs that are squarely built and not as dainty as some may believe. They have long, pointed snouts and long ears that hang down. Poodles have either a harsh, dense, curly coat or a heavily corded coat. The AKC only considers Poodles with a solid colored coat under the standard. Poodles can come in various combinations, though. As you can see, Saint Berdoodle size might range from as little as 4 pounds to up to 180 pounds! They can also range widely in color and have a few different coat types. The most common cross is currently the Standard Poodle St Bernard mix. This dog can be expected to range between 40 and 180 pounds in weight and 15 to 30 inches tall. That means you could end up with anything from a medium-sized to a giant dog. The Mini Saint Berdoodle is also growing in popularity. This is the result of crossing a Miniature Poodle with a Miniature Saint Bernard. They typically range between 20 and 50 pounds in weight and 14 to 18 inches tall. 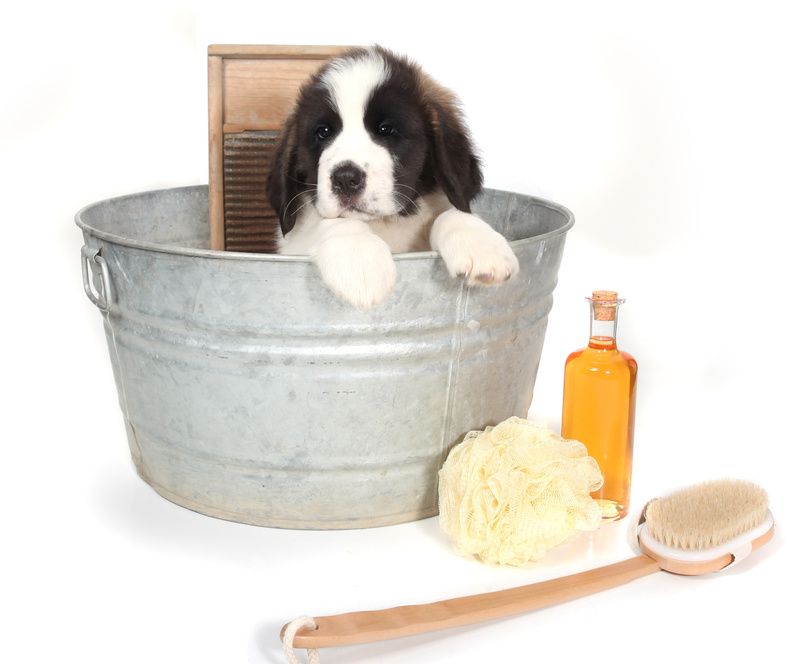 Whether a long- or short-haired dog, Saint Bernards’ coats are relatively low maintenance. They will require weekly brushing during most of the year with a slicker brush or metal comb. Twice a year, during shedding season, brushing will be required daily to help remove loose hair and avoid matting. Poodles, on the other hand, have high maintenance coats. They have very minimal shedding and are often considered hypoallergenic. However, the curly or corded coats need to be trimmed or clipped on a regular basis. You can either learn to do this grooming yourself or take a Poodle to a professional groomer once every month or so. Unless a Poodle has the short Sporting Clip, it needs to be brushed every day, down to the skin, to prevent matting at the roots. A St Bernard Poodle could have the coat of either parent breed or a mixture of the two. This means it could have either a low-maintenance or a high-maintenance coat. If you’re considering a Saint Berdoodle puppy, you need to be prepared for either case. The Saint Bernard is one of the world’s most famous and loved breeds. It was made popular by the Beethoven movies and is considered a patient and watchful “nanny” dog for children (think Peter Pan). These dogs originated as search and rescue dogs. The dogs would go out in pairs to find people buried in the snow. They would dig through the snow and try to awaken the traveler. If he was unable to move, one dog would lie on top of him to provide warmth, while the other went back to the hospice to get help. This care for humans shows the loyalty of this humble breed. They are considered charming dogs but can be playful and inquisitive. If you’ve seen the Beethoven movies, you know what a “bad” Saint Bernard can be like. Without proper training and socialization, Saint Bernards’ natural curiosity can lead to unwanted and inappropriate behavior. Poodles are extremely smart dogs that are eager and loving to their families but can be aloof with strangers. However, they are very people-oriented and eager to please once they get to know you. While athletically built, Poodles are sensitive at heart. They require a gentle, yet consistent touch. Saint Berdoodles could have the temperament of either parent breed or a mix of the two. However, as both parent breeds are people-loving, it is a safe bet that Saint Berdoodles will be the same. There are several known hereditary health issues in both parent breeds. We will cover these briefly as they could also appear in a Saint Bernard Poodle mix. Saint Bernards can also become seriously ill when going from air-conditioned climates to high heat. It’s important to keep these large dogs properly cooled and provide plenty of water in hot temperatures. 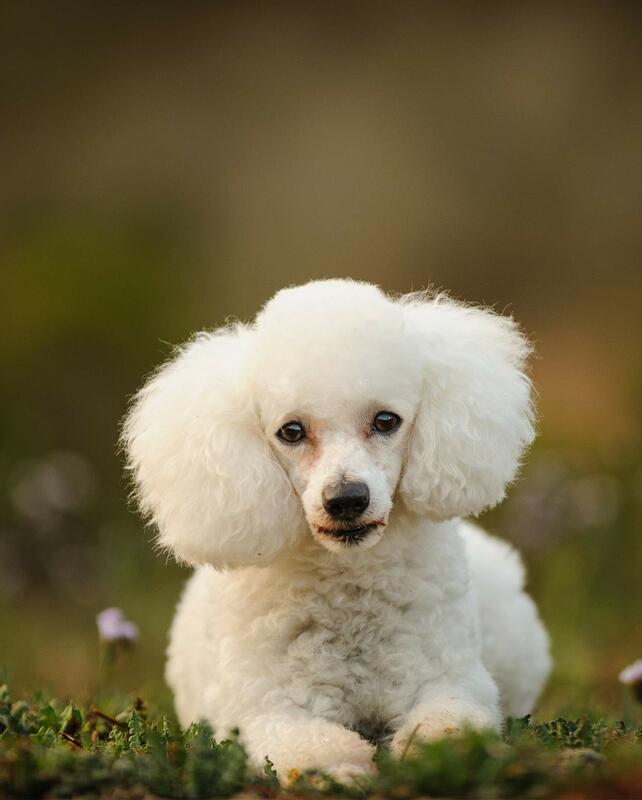 The smaller Poodles are less likely to suffer from sebaceous adenitis or gastric dilatation-volvulus. However, they are at increased risk for orthopedic problems including patellar luxation and Legg-Calve-Perthes. Saint Bernards only require moderate exercise. Most will be happy with a daily walk or play session. However, these dogs can endure much longer treks and excursions. They’ve even been known for pulling children in carts and competing in drafting competitions. Saint Bernards will be happiest exercising with their humans. Playing alone, even in a large yard, will not be enough to satisfy these giants. Early socialization and training classes are extremely important for this breed due to their size and strength. It’s important to teach them manners before they’ve grown large enough to knock people over or eat off the table. Thankfully, Saint Bernards are agreeable and eager to please, so they generally respond well to consistent training. 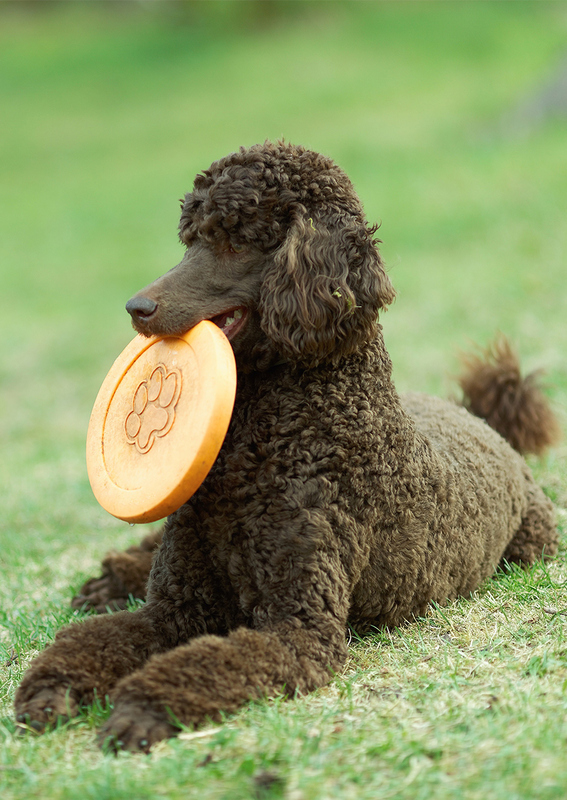 Poodles are higher energy dogs who love being active. They were bred as hunting dogs, so they enjoy and excel at doggie sports such as tracking, hunting, and agility. Poodles are also generally easy to train thanks to their intelligence and agreeableness. However, consistent positive reinforcement is very important. They can react poorly to yelling or too harsh of tones. Positive reinforcement is always an important aspect of training, but warmth and praise are even more important with these gentle souls. A St Berdoodle could end up with either moderate or high exercise needs. However, as both parent breeds love people, playing with its humans is likely to be high on the list of requirements for this mixed breed. A St Berdoodle is also likely to be easily trainable as both parent breeds are. One of the attractions of a Mini St Berdoodle is that the smaller size can result in lessened exercise needs. However, there is no guarantee of this, as these minis can still become quite large (up to 50 pounds). It will be important for a Saint Berdoodle to have a family that is around all, or at least most, of the time. These dogs love to be social and undesirable behaviors can occur if they are left alone for extended periods of time. If you are considering one of these dogs, it’s important to remember that their size, grooming requirements, and exercise needs can vary widely. 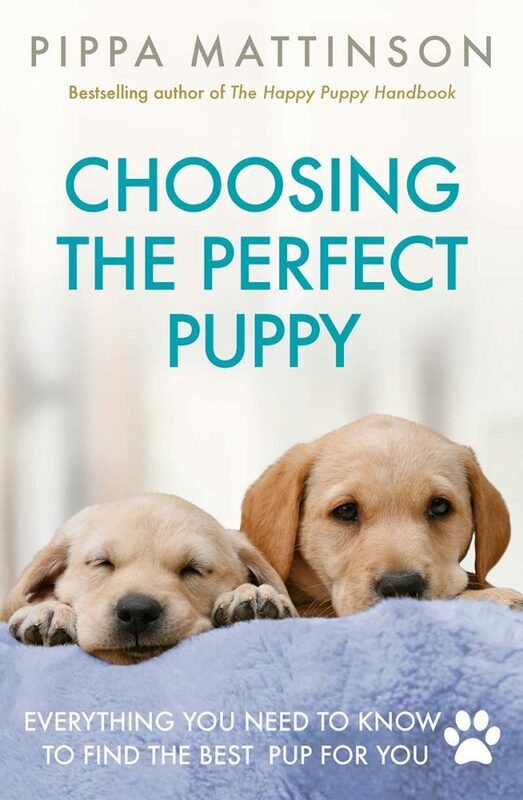 When buying a puppy, know that you could end up with a medium-sized, low maintenance and low energy dog. You could also end up with a giant that weighs as much as a full-grown person, needs regular professional grooming, and is high energy. Or you might get anything in between. Saint Berdoodles are generally great with other dogs, animals, and children. 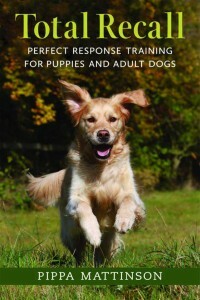 However, proper socialization and training are always important. Although Saint Berdoodles are not registered as a purebred, the number of breeders is growing with the popularity of the Doodle phenomenon. You can find Saint Berdoodle puppies online through one of the mixed breed registries discussed earlier or through breeder websites. Make sure any breeder is reputable, and that the background of the parent dogs, health, and upbringing of the puppy is known. All puppies should be tested for known health issues apparent in the parent breeds. You should also ask to see the elbow and knee scores of both parents to check for the likelihood of dysplasia. Some breeders will claim St Berdoodle puppies are hypoallergenic. Be aware that not all of them will be, even with a curly Poodle-like coat. If you or a family member have allergies, you should have the dog’s saliva and hair tested to ensure you will not react to it. Sweet and loyal, but potentially huge. This mix will most likely end up being a smart and adorable puppy. Is this designer dog right for you? Let us know in the comments below what you think of the Saint Berdoodle. Beuchat, C. The myth of hybrid vigor in dogs…is a myth. The Institute of Canine Biology, 2014. Harasen, G. Patellar luxation. The Canadian Veterinary Journal, 2006. Lim, C., Bakker, S., Waldner, C., Sandmeyer, L., Grahn, B., Cataracts in 44 dogs (77 eyes): A comparison of outcomes for no treatment, topical medical management, or phacoemulsification with intraocular lens implantation. The Canadian Veterinary Journal, 2011. Pedersen, NC., Liu, H., McLaughlin, B., Sacks BN. Genetic characterization of healthy and sebaceous adenitis affected Standard Poodles from the United States and the United Kingdom. Wiley Online Library, 2012. Strain, GM. Deafness prevalence and pigmentation and gender associations in dog breeds at risk. The Veterinary Journal, 2004. Trbolová, A., Ledecký, V. The relationship between the occurrence of lens cataract and progressive retinal atrophy and some categories of poodle breeds. Folia Veterinaria, 2000. Sorry, but this is a expensive mutt. Go to rescue to adopt a saint mix. I’ve been in Saints for 25 years, this “designer” breed is garbage. The labradoodle designer wrote how sorry he was for combining the two breeds. It brought the combination of both health problems in one dog!! Recently bought a St Berdoodle. Mom is St Bernard and dad is standard poodle. Had St Bernard’s my entire life. My dog is a female. Looks more St than Poodle. Now 14 wks., weighs 35 lbs. long legs n big paws. Long ears and nose. Longer than St. No drool and no shedding. Don’t seem as smart as a full blood St.
Maybe to early to tell. Did you manage to find one please? I can’t find one anywhere in the UK the breeders all seem to be in US! Hi, are there any saint berdoodle breeders in the uk please? Adopting a St Berdoodle for Service Dog. Anyone had St Berdoodle Service Dog? Happy? Does anybody know any breeders in the UK for St Bernoodles- cannot seem to find any. We just adopted a St. Berdoodle this spring. He is now 5 months and has been very affectionate to all members of our family. He is playful and has been very easy to house break and train. He was around 40 lbs at around 4 1/2 months. He is great with our children 7, 10, 15, and older. Hi, what breeder did you get your lovely dog from?